The Christmas party was held at Mimi's Cafe 18461 Brookhurst Ave. in Fountain Valley. Club President Larry Hoffman - K6LDC turned the gavel over to Bob Buss - KD6BWH and the new club officers were introduced. At the November meeting David Corsiglia - WA6TWF talked on antenna ground systems. 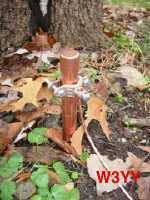 Proper grounding is important for safety as well as improved signal radiation. A new slate of club officers were also eected at the meeting. The 2000 ARRL Southwestern Division Convention was held in Scottsdale, AZ on the first full weekend in October at the Ramada Valey Ho Hotel )6850 E. Main St. The OCARC declined performing the Wouff Hong ceremony due to the cost of travel and lodging. Numerous club members did attend however. At the September meeting Al Avenet - AB8AA talked on a new mode of communications - Phase-Shift Keying 31 Hertz. This mode, available via PC and Mac software, is a new technology for keyboard-to-keyboard digital communications. Help us out here. there was no record of the program that was held at the August 2000 general meeting. I searched the minutes and the RF Newsletter. OCARC members and friends provided communications for the Marathon competition of the Claifornia Classic horse driving event. 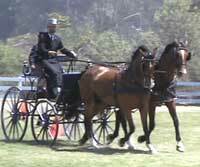 This event, held in Ernie Howlett Park in Rolling Hills (Palos Verdes) and sponsored by the Heels & Wheels Driving Club, is a lengthy course with timed "hazards" along the course where the horse and carriage must navigate the "hazard" in a clean fashion. The "hazards" are timed and penalty points are given for errors disrupting obstacles. Jul 26, 2000 (Wednesday evening). The OCARC held a pizza bust at Me & Ed's Pizzeria at 12731 Garden grove Blvd. in Garden Grove. Led by club president Larry Hoffman club members put away lots of pizza, soda and even some beer. Sadly, in the summer of 2006 Mike and fellow amateur David Gordon-Ross N6IDF were killed when Mike's jeep went over an enbankment during a T-hunt. The club supported the OCCARO booth at the Orange County Fair for the day. The event continued into the late evening when, Bob - AF6C, supported by Ken, W6HHC ran the ten meter net from the fair booth. Club photographer Ken - W6HHC shared with the club slides from numerous previous OCARC W6ZE Field Days going back to the late sixties. Rosie spoke on the NTS at our May meeting. Larry Hoffman - K6LDC and Art Dillion - KE6WOX coordinated this hamming event. This year a group of club members went to a private spot near Aguanga, CA [Temecula area] to camp out and work some locals and DX. Vice Director, world traveler and advanced photographer Art Goddard - W6XD spoke on a DXpedition to the island of Sri Lanka. A group of OCARC hams supported the Orange Police Department in the annual Baker-to-Vegas race. This year the club also supported the Garden Grove team. Frank Smith - WA6VKZ talked about 12-volt battery systems for powering your ham gear and accessories. This is a useful way to be prepared for an emergency when you lose AC power. Joe Moell- KØOV presented a program on Radio Direction Finding and Transmitter hunting. April Moell - WA6OPS Talked on the HDSCS organization. Feb 5th, Mar 4th, and Apr 1st. September 5th* at 7:30 PM (Tuesday). Oct 7th, Nov 4th and Dec 2nd.